Oh my goodness he is getting so big! He is such a cutie! Hopefully the teeth will come soon!! I can't believe he is sitting already!! What a big boy! Oh my goodness his little legs have gotten chubby and I love it! 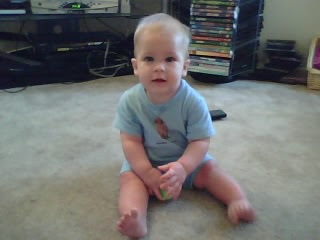 He is such a good baby and they all grow up way to fast!! !